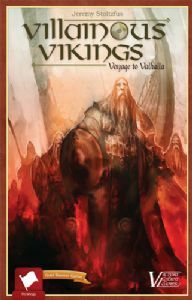 For 3 to 5 players, Villainous Vikings is a rousing game of Viking exploration and conquest. With players confronted by constant Raid or Trade dilemmas, the decisions will take you to the highest seat in Asgard next to Odin. Your goal in Villainous Vikings, by designer Jeremy Stoltzfus, is to amass as many Valhalla Points as possible so that after Ragnarök occurs your Captain has the best seat in Valhalla to tell his tales of battle and drink his mead. You will gain Valhalla Points by raiding, trading, and battling the other Captains who are also vying for Odin’s favor. After one of the players has been declared the victor of Ragnarök, each player will tally up their Valhalla Points to determine their overall standing with Odin the All-Father and the other Gods; whoever is in the best standing is considered the greatest Viking(s) in history! In this Second Edition, almost everything in the box has been revised for better balance and clarity: the map, the cards, the rules, and even the counters.